In the 1960s, about the only place you'd see a computer chip was in a mainframe the size of a refrigerator. Today, chips are in car keys, passports, toothbrushes, greeting cards and stuffed animals. No wonder Imec, the Belgian design organization that helps industry partners develop computer chip technology, has been broadening its horizons. Its core work is figuring out how to make microprocessors that will arrive on the market in five or 10 years, but among its 604 partners are an increasing number of companies outside the traditional computing industry. In other words, Imec's nearly 2,400 researchers are helping improve not just your smartphone and your watch, but also your self-driving car, your grocery store's fruit and your doctor's medical equipment. A chip that detects cancer cells. A tiny fluid channel streams blood cells one by one over an image sensor at a rate of 4,000 per second. If a cancer cell is detected -- a rare event occurring only a few times in the 100,000 cells found in a 1-milliliter blood sample -- the chip redirects it into a separate holding pen for later analysis. Imec hopes to speed the process with chips with several channels working in parallel, said Liesbet Lagae, Imec's research and development manager for life science technologiesA sensor that spots bad crops and skin disease. Typical digital cameras today capture red, green and blue light to take a photo, but Imec's "hyperspectral" image sensor captures as many as 150 precisely chosen colors. It won't make your vacation photos any better, but it's really useful in judging the precise freshness of fruit being sent to grocery stores or emailing the right data to a doctor to judge whether that mole on your shoulder is benign, said Andy Lambrechts, an Imec imaging program manager. Hyperspectral cameras today typically cost around $30,000, but Imec's chips cost just a few dollars -- cheap enough that farm equipment towed by a tractor can scrutinize crops and instantly adjust the amount of fertilizer sprayed. Autofocusing contact lenses. 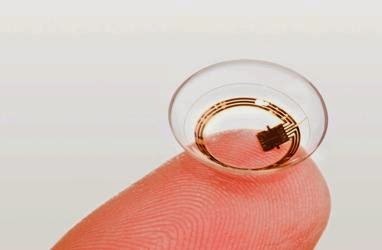 "Nearly everybody who wears contact lenses stops wearing them when they start to need reading glasses," said Chris Van Hoof, Imec's program director of wearable health care. Imec hopes to adapt contact lenses so they can give your eyes a focusing boost when you're trying to see something close. The lenses themselves have regions suited for close focus and farther focus, but detect where you're trying to focus and let light through only the appropriate part of the lens. Better solar panels. Today's solar panels made of silicon crystals convert less than 20 percent of sunlight into electrical power, but adding a thin, transparent film on top could boost that efficiency past 30 percent. It's tricky finding thin-film materials that can match silicon's long lifespan, but one strong candidate is the mineral perovskite, said Jef Poortmans, program director for Imec's photovoltaic work. Higher efficiency will mean you can get by with smaller panels on your house, lowering the cost of solar power installation. The thin-film solar panels could be built into windows, too. "It is quite clear that over a period of 50 years, photovoltaic [solar] will be the cheapest source of electricity," Poortmans said. Better energy storage. Today's batteries use liquid ingredients, but Imec is working on an alternative called solid-state batteries that it hopes will last longer and hold more energy. That could help phones,laptops, electric cars -- and solar power. "Storage will be crucial to have massive deployment of photovoltaic energy," Poortmans said.